A huge thank you to all the lovely people who stopped by the mending stand and joined me for the mending workshop at Oslo Knitting Festival! You really made my weekend! Now, showing off mending samples and explaining techniques is all well and good, but what everyone really needs is a tutorial, right? Right. 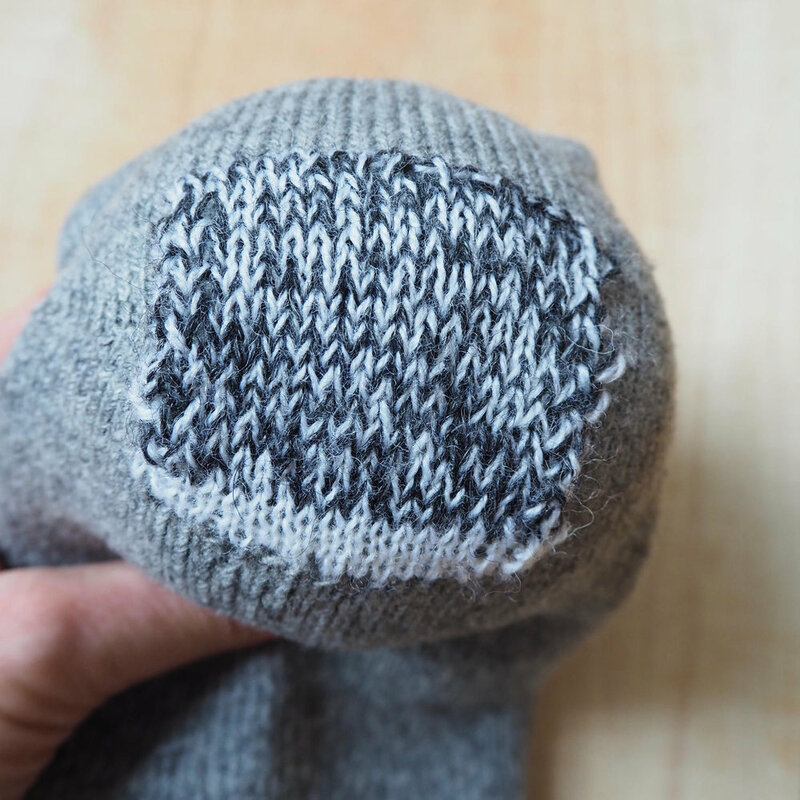 Here are my three favourite basic approaches to mending knits. This is the classic all-purpose darn that perhaps most people associate with ‘darning’. Practical and versatile, it works for most types of holes, but is not invisible. Choose darning thread or yarn that is a little thicker than the original knit fabric to ensure the finished weave is not too airy. Alternatively, you can create a tighter weave by spacing your threads closer to each other or using double thread in one direction. From the right side of the knit, start a few rows below and to one side of the hole. Work across, weaving your needle over and under the stitches on the row. You will work back and forth horizontally, weaving over and under the stitches and alternating on every row: over-under-over on the first row, then under-over-under on the next, and so on. When you reach the hole, gently pull the yarn across and continue as before on the other side. Once you have created a patch somewhat larger than the hole, turn and work vertically up and down. To avoid a bulky edge, start a little closer to the hole keeping inside the horizontally worked patch. Weave over and under the horizontal threads. (So, you want to go under every visible horizontal thread.) When the hole is covered, finish by attaching the ends on the back. It is worth noting that the weave darn alters the character of the fabric. The original loopy structure of the knit is replaced by a stable weave. This means that the darned area looses its stretch. This may not be a problem at all. But you can also partly compensate for this by working diagonally instead of vertically in step 3. Alternatively, you can work the whole darn diagonally which will give a more stretchy darn. However, you then loose the even spacing of the original stitches as your guide and it is harder to get an even and neat finish. 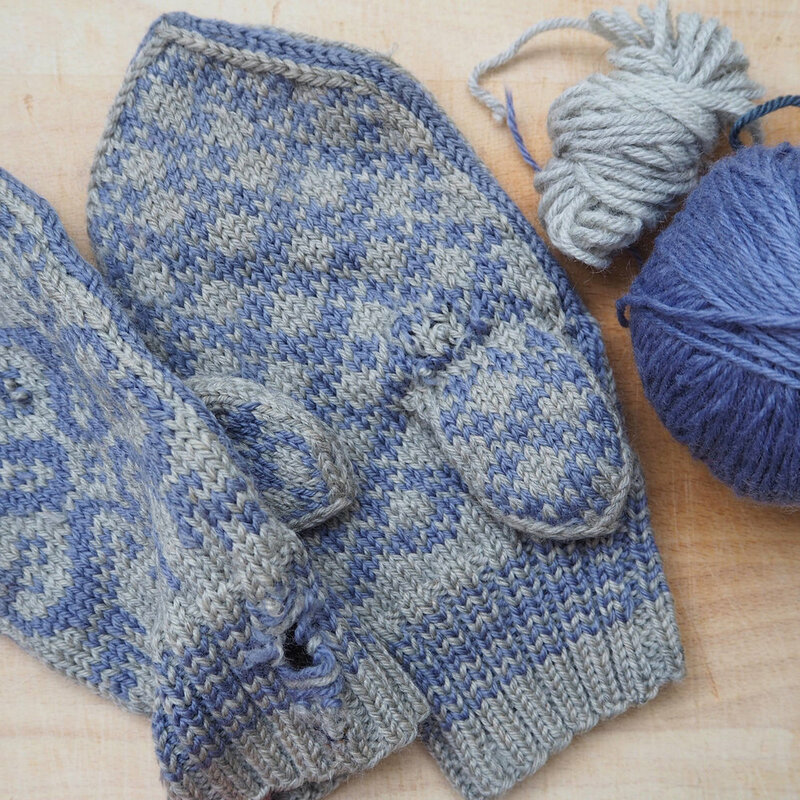 Duplicate stitch can be used to reinforce thinning areas in knits before there is a hole. Of the three techniques, it gives the neatest finish but is also the most time-consuming. 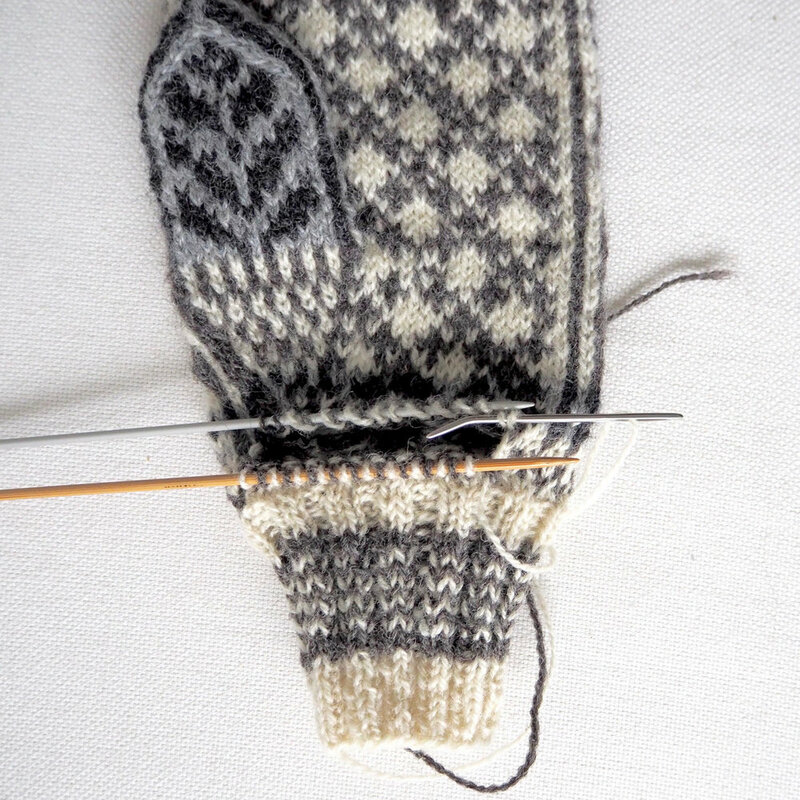 It is simply a way of working over the original stitches of the knit with a tapestry needle. This maintains the original structure and stretch of the knit fabric, and can be close to invisible if you use matching yarn. Starting from the back, pull the needle through the middle of a stitch and follow the loop of the stitch up and under the two threads of the stitch above. Push the needle back through the middle of the stitch where you started and up through the middle of the stitch next to it. Continue along the row. 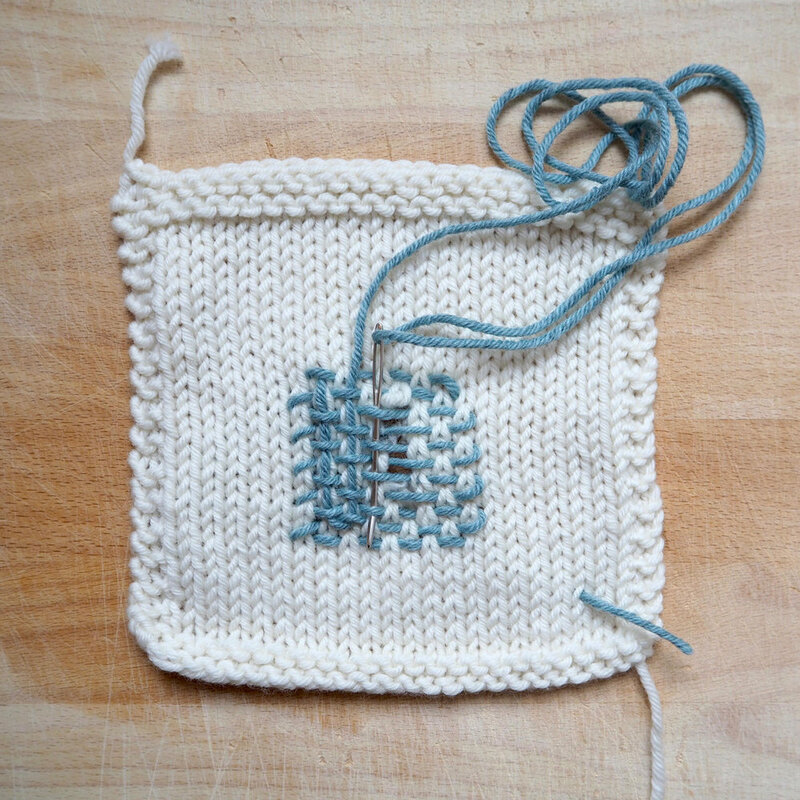 It may help to visualise each stitch as a ‘v’. To move up a row, push the needle through the middle of the last stitch worked and up through the middle of the stitch above, i.e. under one horizontal bar. Continue along this row, working in the opposite direction. Work back and forth over the area you want to reinforce. Finish with the ends at the back. 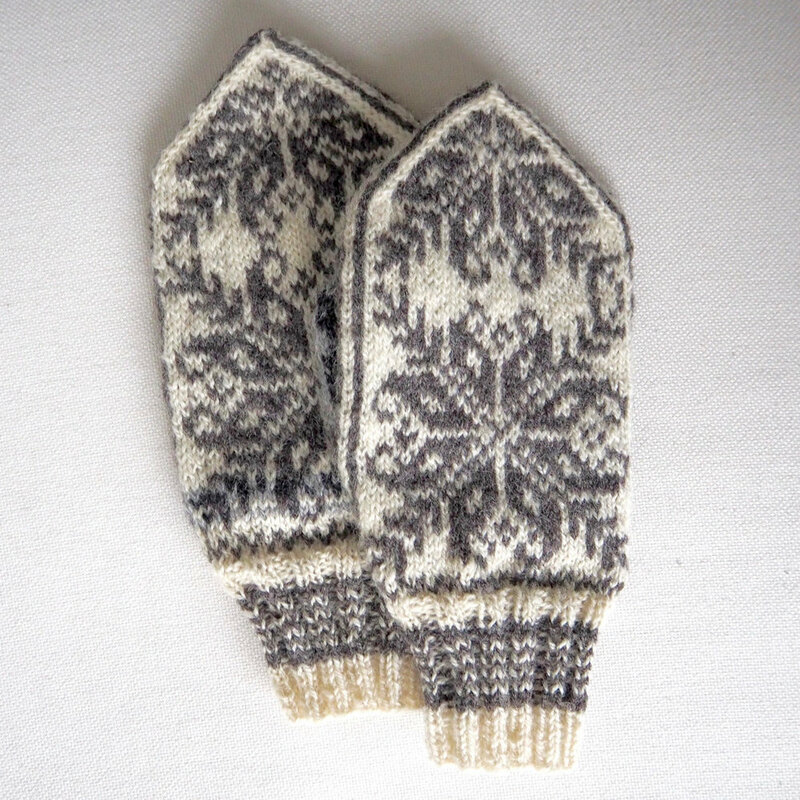 A knitted patch is a great way to cover larger worn areas fairly quickly. 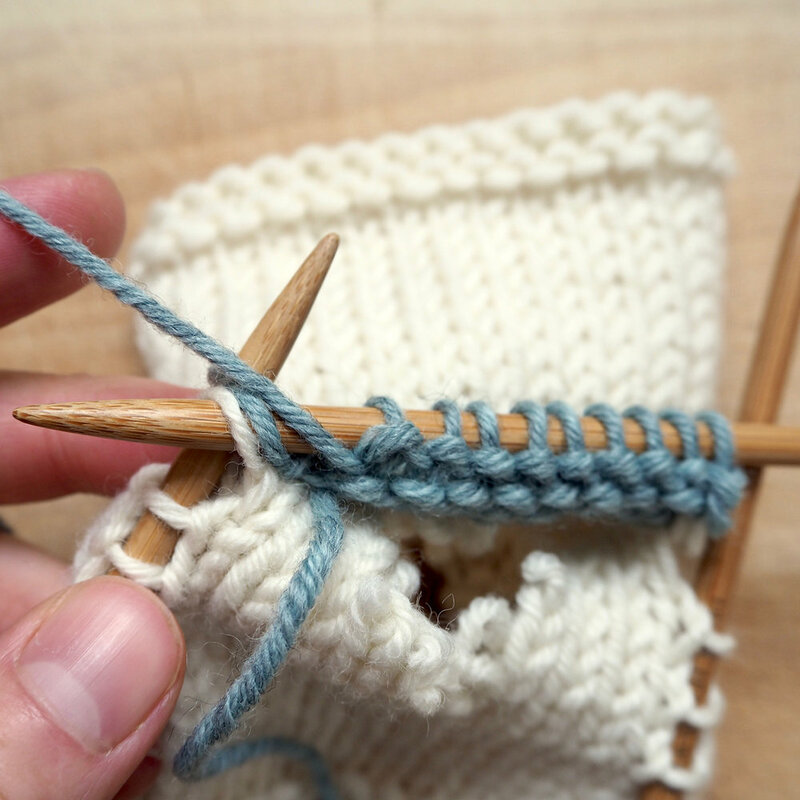 In principle, you knit a pocket that is closed at the top. This leaves a double layer of knitted fabric where the garment is patched. You will need the same gauge for the patch as the original knit or you may end up with a patch that is too baggy or too tight. Also, if you are working over a hole you may want to secure the edge with a circle of basting stitches or similar, so it doesn't unravel any further. At either side of the hole pick up every other horizontal bar between two columns of stitches. 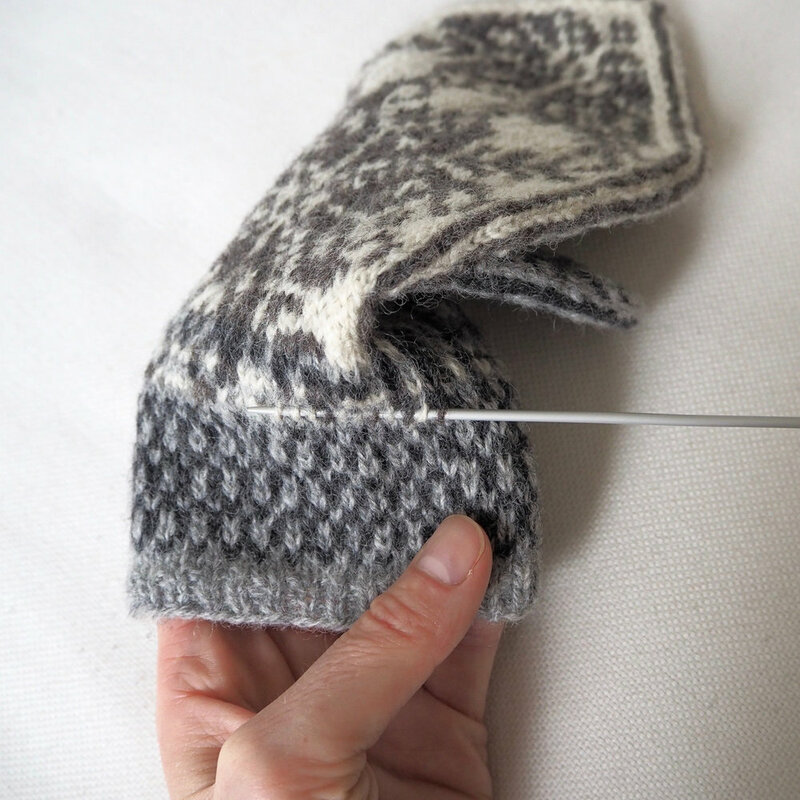 Pick up and knit a row below the hole keeping in between the needles at either side. Knit the first stitch as usual. 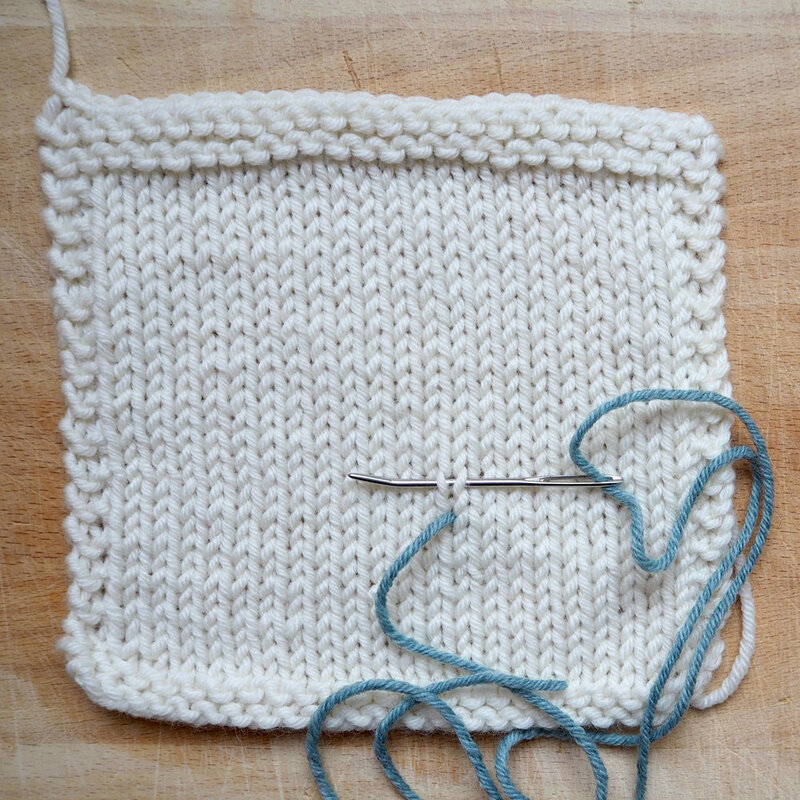 Knit the last stitch together with the first stitch on the needle at the left-hand side. Work back and forth in stockinette. 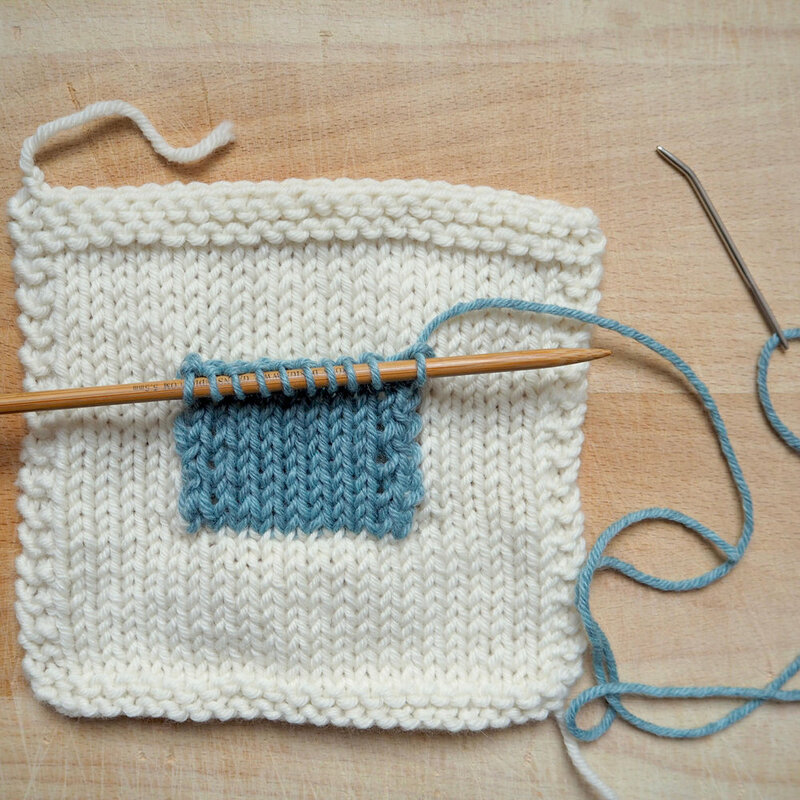 On every right side, the last stitch is knit together with the first stitch on the side needle. On the wrong side, the last stitch is worked together with the first stitch on the side needle as 'purl 2 together'. When the hole or worn area is covered, snip the thread leaving a tail long enough to sew the patch closed at the top (approximately three times the width of the patch). 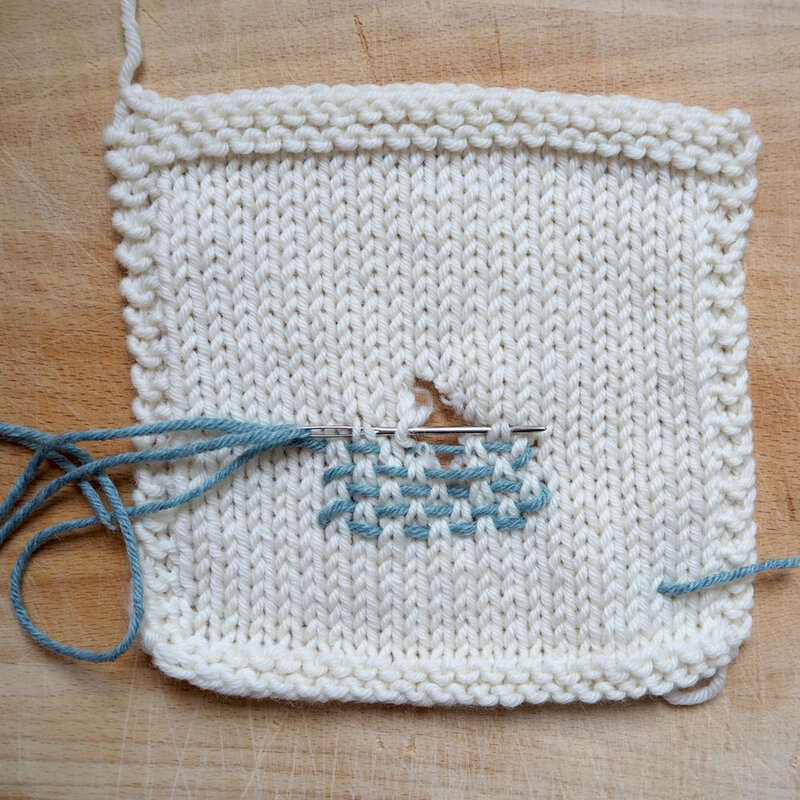 Use a tapestry needle and graft the patch in place using kitchener stitch. 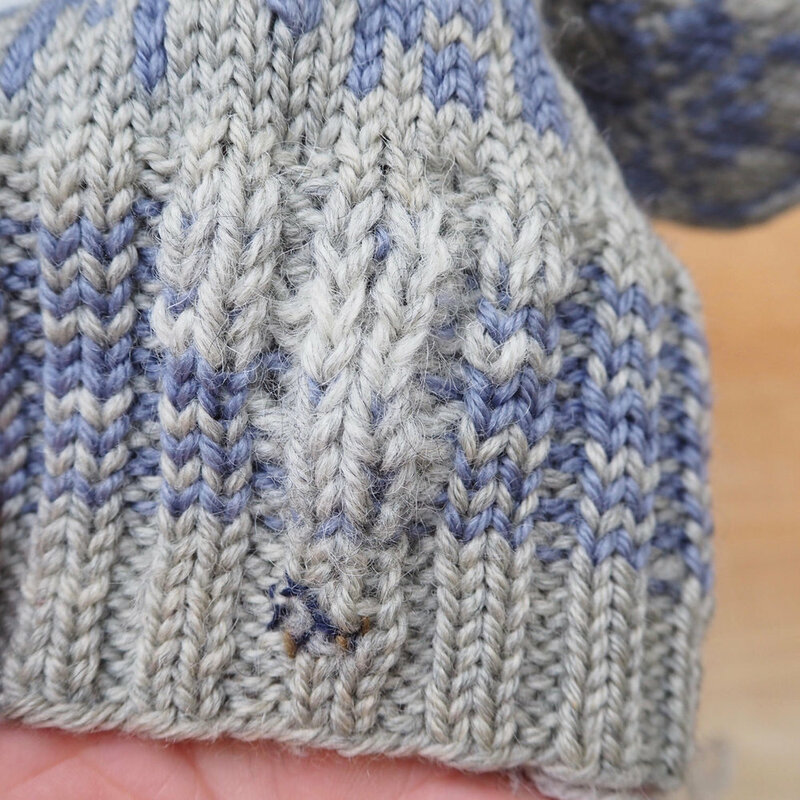 As an alternative, you can also knit the patch first and sew it on afterwards using mattress stitch along the side edges and kitchener stitch along the top and bottom. 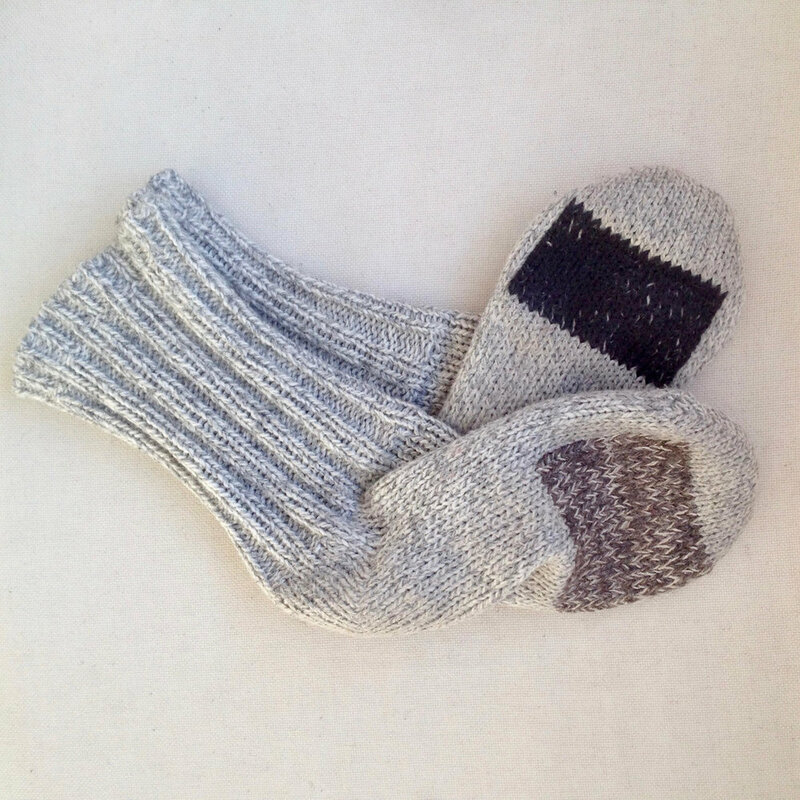 In the picture of the stripy jumper above, the right elbow patch was knitted first and attached afterwards while the left elbow patch was knitted straight onto the jumper as explained in the steps above. 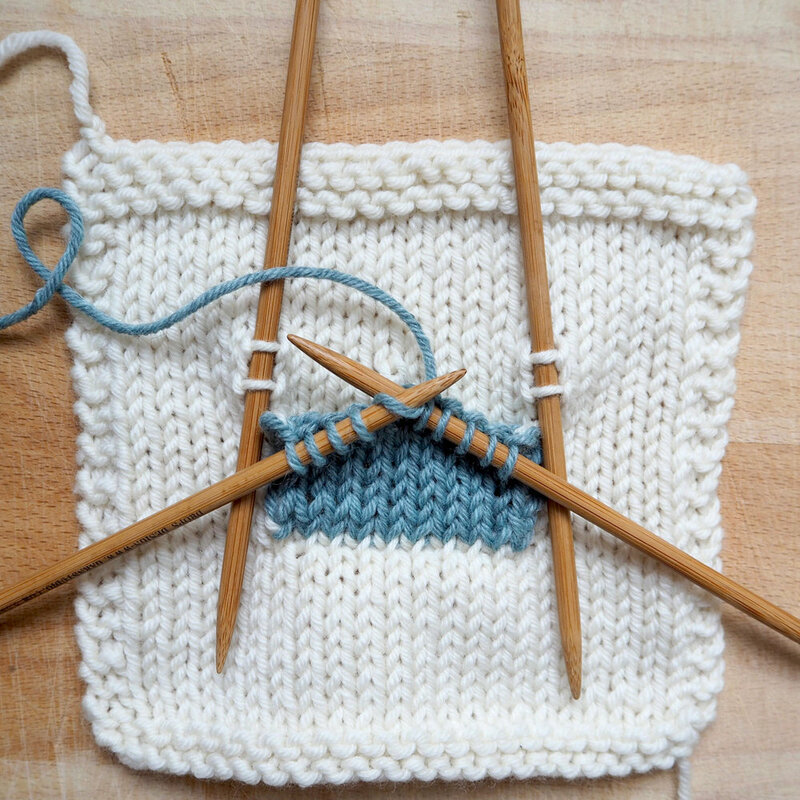 With these three techniques in your knitting vocabulary you can mend pretty much any knitted garment. Build upon these and vary them, go more advanced or keep it simple. 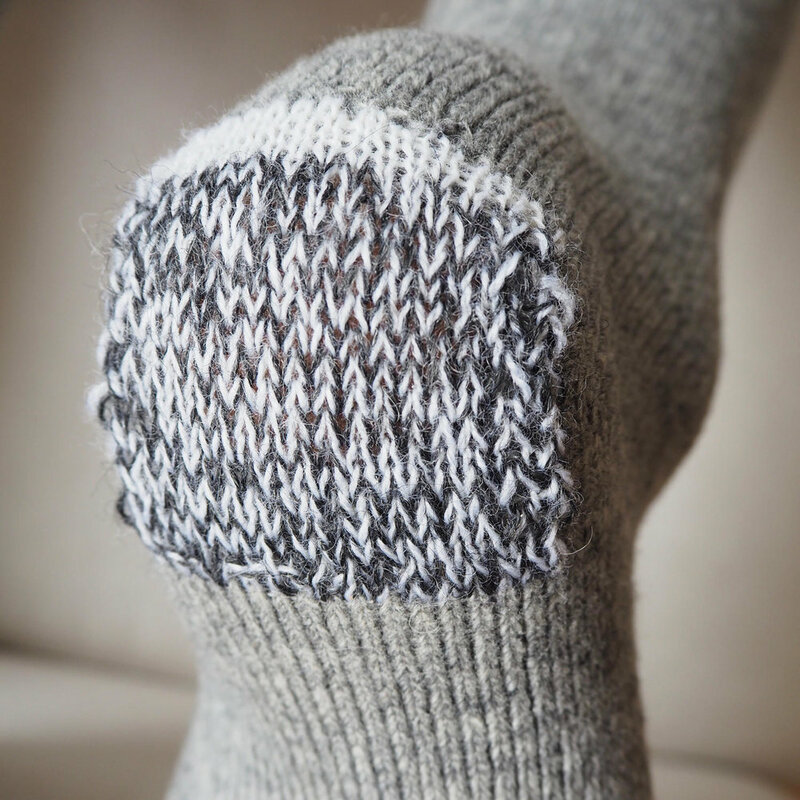 As with knitting, there are countless ways to go about mending. Have a go! And happy mending!